Sometimes nights out lead to mornings filled with dietary regret. If that’s the case, then you’ll want to help undo the bad with a healthful breakfast made with detoxifying foods. With chilly mornings a near certainty for the next few months, a breakfast that warms you while helping you get off to a good start is in order, so here’s a warming detox breakfast to make the next time you feel bloated and blah from the night before. Oatmeal with fresh fruit: Whole grains help regulate your digestive tract, a major key in a detoxifying diet. Choose a bowl of natural, plain oatmeal — not the prepackaged sugary kind — and add slices of apple or another fruit. Fresh fruit contains high levels of antioxidants and fiber, which help flush toxins from your body. 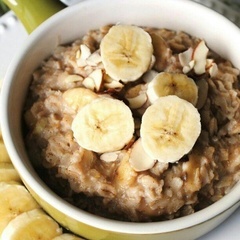 Get more healthful oatmeal recipes here. Green tea with lemon: Green tea contains high levels of catechins, which speed up liver activity and promote the production of detoxifying enzymes. Add a squeeze of lemon for an alkalizing kick. Ginger green juice: Need extra detoxifying help? Whip up this spicy green juice; while it’s served cold, the addition of ginger to the simple recipe warms your body, and the lemon, ginger, and parsley in the juice all help your body detox. Make this in the morning, and take it along with you to work in a mason jar for a midmorning pick-me-up.